The P-SightTM is the only drop-in rear blade sight for the popular Kel-Tec P-3AT and P-32 pistols. It mounts easily into the existing rear sight cavity. 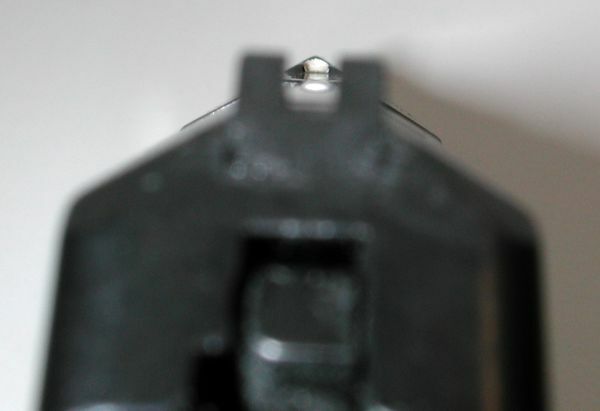 The P-SightTM provides a greatly improved sight picture, yet its rounded low profile does not create any snag hazard or detract from the concealability of the pistol. In addition, these pistols tend to shoot low using the factory sights, so the P-SightTM was designed to bring point of impact up to point of aim at a range of 5 yards. 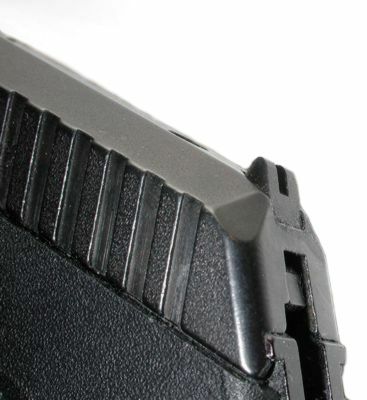 IMPORTANT NOTE: Years ago, Kel-Tec redesigned the P-3AT and P-32. The new versions of these pistols have a flat-topped slide with small blade sights already built in. If your pistol is the new version, as shown at right, the P-Sight will not fit. If you are not sure which version pistol you have, email us and we'll be glad to help you! Second-generation slide, NOT compatible with the P-SightTM.